See the coins in the back denoting the conventional material world, wealth, success. 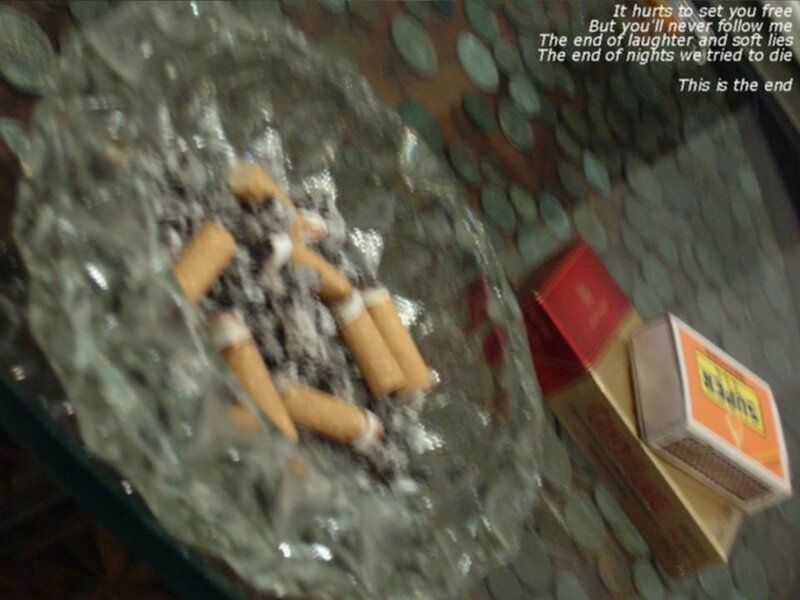 And the ash tray, the cigarette denoting succumbing to the gray. The gray overrides the conventional. It is closer to you, more prominent in the frame. You give up the laughter (the joy of the conventional game) and the lies (the rules of the conventional game), and transition from the material mattering so much to where it just does not matter anymore. It hurts at first to end that game you played with your sweat and your blood. But you know it does not have any more for you. It will not follow you. It’s not your fascination anymore. The old rules are gone. The old game is over. You are no longer trying to die. Perhaps, in some ways you are dead already. The passing over to the new world. The End.